Although CAPM approach has been widely accepted as a determinant of required return .of a security (asset). it is beset with a number of restrictive assumptions affecting its application in practice. For instance, the CAPM framework assumes that there exists a market portfolio consisting of all risky assets. 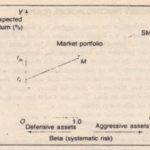 Apart from the unobservable asset of such a portfolio, the portfolio itself may provide different results. For instance. portfolio in India (the rate of return earned on which is used as proxy of Rm in CAPM) may consist of the Risk share price index, the Economic Times share price index, the Financial Express share price index, Sensex of RSE and the NIFTY of NSE. Obviously, the rates of return of these portfolios are nut likely to be equal: the required return of the security will vary. The Arbitrage Pricing Theory (APT) is an alternative model of asset/security pricing which has received considerable attention in the financial literature in recent year as it is devoid of the CAPM : assumptions. The APT model was developed in the 19705 by Ross. As the name implies, the APT is based on the concept of arbitrage. In the context of pricing of (return from) securities, arbitrage implies finding/availability of two securities which are essentially the same (having different prices returns). In such a situation, it will be profitable for the investor to sell the expensive one. The theory is based on the premise that security prices adjust as investors form portfolios in search of arbitrage profits. When such opportunities' of earning arbitrage profits are completely exhausted, the prices of securities are said to be in equilibrium. This leads to the state of capital market efficiency, free of arbitrage opportunities, In other words. arbitrage will ensure that riskless assets (or securities) provide the same expected return in competitive financial markets".